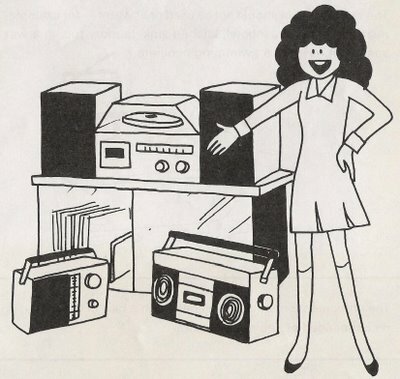 An all-in-one radio-phono-cassette-deck, a portable radio, and a portable cassette-player? Who wouldn't be happy? I found this image in a pamphlet titled "Important Safeguards," which came with my purchase of a "component" system in 1983: a Harman/Kardon receiver, a Dual turntable (maybe the most temperamental turntable ever made), and Infinity speakers (all long-defunct). From the New York Times obituary for James Conway Sr., co-founder of Mister Softee. On my block in Brooklyn, the Mister Softee truck would arrive mid-to-late afternoon. I can't remember a thing about the ice cream, but the Mister Softee jingle is a permanent sound of summer in my head. » Mister Softee Jingle: Not So Sweet? This Yahoo, excuse me, Yahoo! search led someone to my blog last week, specifically, to a post on a simile from Dante's Inferno. Alas, the post doesn't explain what the hell "simile" means. It offers an example of what the hell is like. The analysis of great works now often takes place beneath the auspices of Narcissus. The student is taught not to be open to the influence of great works, but rather to perform facile and empty acts of usurpation, in which he assumes unearned power over the text. Foucault applied at industrial strength is an automatic debunking agent. But the process leaves the student untouched, with no actual growth, just a reflexively skeptical stance that touches the borders of nihilism. Such activity, prolonged over the course of an education, is likely to contribute to the creation of what the philosopher James C. Edwards calls "normal nihilists." Normal nihilists are people who believe in nothing (except the achievement of their own advantage), and we may be creating them in significant numbers by not counting the ethical costs of our pedagogy. "It's easy to be brilliant," Goethe said, "when you do not believe in anything." And it's easy, too, to be brilliantly successful. The sense of superiority that current liberal arts education often instills rhymes with some of the least creditable trends in our culture. It rhymes with a superior and exploitative relation to the natural world, with condescension to the poor, with a sense that nothing in the world matters unless it matters to Me. . . .
What's missing from the current dispensation is a sense of hope when we confront major works, the hope that they will tell us something we do not know about the world or give us an entirely fresh way to apprehend experience. We need to learn not simply to read books, but to allow ourselves to be read by them. And this process can take time. Describing his initiation into modern literature, into Kafka, Joyce, Proust, and their contemporaries, Lionel Trilling writes: "Some of these books at first rejected me; I bored them. But as I grew older and they knew me better, they came to have more sympathy with me and to understand my hidden meanings. Their nature is such that our relationship has been very intimate." "I bored them," says Trilling. Given the form of literary education now broadly available, it is almost impossible that a student would say of a group of books, "I bored them." No, in the current consumer-driven academy, another word, differently intoned, would be on the tip of the tongue: "Booooooring." We professors have given our students the language of smug dismissal, and their profit of it is that they know how to curse with it and to curse those things that we ourselves have most loved and, somewhere in our hearts, probably love still. 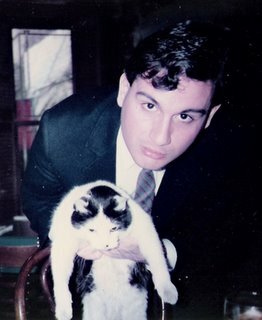 My friend Aldo Carrasco — Aldo Egbert Carrasco y Febles — died twenty years ago, May 28, 1986. Aldo was an extraordinary guy — wickedly funny, passionate about literature and music, devoutly Catholic (despite all challenges), utterly loyal to his friends, utterly intolerant of bigotry, hypocrisy, and pretension (or "pretension flambé," as we called it — my coinage). He was a "grand guy, period," as he once joked. I first knew Aldo, very slightly, through mutual friends at Fordham University in the Bronx, New York. After I moved to Boston in 1980 to work on a doctorate, our friendship deepened through the mail. As I remember, we met up at a party in the Bronx and agreed to correspond. Our friendship ran to Aldo's death — my wife Elaine and I last saw him in the hospital just a day before he died. Aldo was a letter-writer without peer. Knowing that, I'm still astonished to see, going through boxes of correspondence, how many letters he wrote, and the length of those letters — often four or five pages, sometimes handwritten on legal pads, loose-leaf paper, sketchpads, exam booklets, paper placemats; sometimes typed, single-spaced, on a manual typewriter. Some letters are made of separate pages written over two or three days. I was evidently quite the letter-writer too, as many of Aldo's letters begin with thanks for my latest "tome," followed by a commentary on the funniest bits. 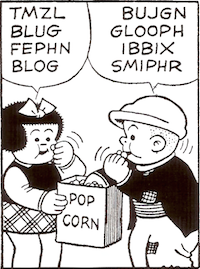 Nowadays I suppose we would have "kept in touch," as they say, by e-mail, in which case much of what we said to one another might never have been written. I've preserved all idiosyncrasies of punctuation and spelling in these excerpts. (Aldo picked up my habit of ignoring the Shift key when typing.) All ellipses are in the letters. I've omitted a few names, though those involved are unlikely to read these excerpts. I've added dates and a few notes in brackets. And I've preserved all true confidences: what was private, is private. If what Aldo wrote on March 14, 1981, holds, I think he'd love the idea of other people reading these passages. Anyone who knew him will hear him in these words. And if, reader, you didn't know him, they might provide a glimpse of a friend whom you would like to have known. i may not have told you that ive decided not to go for my phd right away. now, dont panic, i didnt say ever but im very certain that i want a break. the thought of going on next sept depresses me beyond belief. id much rather teach in a HS for a while or a community college, id even gladly take my phd part time as i work. Aldo's letters during his time at Columbia are quite happy. He took classes in German (with As) and was working with congenial people. He was happy for me too, as in January 1984, I'd met Elaine Fine, whom I would later marry. Elaine and Aldo first talked when she, at work, called him, at work, and made him guess who she was. He did, right away. YOUR RESERVE FOR 1,098 METRES OF 5303, ALDO, IS VERIFIED AND ENCLOSED YOU'LL FIND A PRESENT STOCK CUTTING OF THE ALDO FOR YOUR APPROVAL. THANK YOU. PS. HELLO MY CHILDREN: BELIEVE IT OR NOT THERE IS A FABRIC IN THE LINE NAMED — ALDO — AND IT CORRESPONDS TO THE CUTTING I SENT YOU. THEY TELL ME HERE THAT IT WAS NAMED AFTER ME. I'M NOT SURE THAT THEY'RE TEASING ME. chicago, local bastion of culture, is quite far far far far far far far far far away . . . so forget it. new york, le centre d'univers (or as husserl (sic) put it, "where it's at") is on venus. boston? what's boston? i'd take heart tho'; for a mere thirty miles, or so, to the west, you have the county of "christian." Be advised: __________ has contacted its law firm, the very reputable Ogilvy, Boylston and Appleton of Quincy, Massachusetts, and shall soon take action against Michael Leddy, Chic Interiors of Brookline for non-payment of services and goods. Please refer to invoice numbers 3488001, 636542, and 487760 which total $234,098,988, and that's in good ol' Yankee cash, friend . . . so pay up, or we'll have Harry (Mr. Ogilvy) break both your legs. Thanks for great letter. Nice and long and all that wonderful single spacing! And no! you didn't repeat yourself. Teaching went very well today. Excellently actually. The kids are wonderful. The school is wonderful. The principal is wonderful. The neighborhood is wonderful. So something's going to go wrong. It has too. This is too good. Of course, it's only been one day. But I'm sure I'll feel comfortable in six months or so, and really "in" next September. Tomorrow there's a faculty luncheon. So I get free food in a yuppie restaurant in Park Slope. I miss you both terribly and am not thrilled that I just can't indulge myself in the Eastern Shuttle. Damn. Now that Atherton Place [where Elaine and I had lived in Brookline, Massachusetts] is under enemy command anyway, what wld. be the use? Hope that — sorry, went away for a minute and forgot what I wanted to write! I just can't remember . . . well, I'll take this for an omen and say bye. Have to get up at the ungodly hr of 6 of the a. m.
The novelist, poet, critic, and editor Gilbert Sorrentino died this past Thursday. I have a special affection for his novel Aberration of Starlight (1980), which draws upon details of Depression-era Brooklyn — Ebinger's bakeries, Owl's Head Park — that were still in place when I was a boy roughly three decades later. Like the characters in the novel, my family lived (when I was very young) in the same neighborhood as Johnny Roventini, the famed "Call for Philip Morris" bellhop. But Aberration of Starlight has much to offer a reader who knows nothing of Brooklyn. It's a postmodern narrative of great comedy and great pathos, told in four sections, each focused on one character's perspective. (Yes, like The Sound and the Fury.) Each section is made of ten smaller sections, each employing a different narrative strategy — a tableau, a letter, a fantasy, a catechism, and so on. (Yes, like Ulysses, times four.) Sorrentino puts all this narrative art to a deeply human purpose. The last time I taught Aberration of Starlight, I could barely read its heartbreaking last paragraph aloud. who were friends of mine. The weathers, the weathers they lived in! Christ, the sun on those Saturdays. The name Charles Van Doren will bring to mind the quiz show Twenty-One and scandal. But here's another way in which Charles Van Doren might be remembered -- as a deeply thoughtful student of the sorrows and possibilities of human life. "The way downward is easy from Avernus. There is the trouble, there is the toil." None of us can take Aeneas's journey, nor, in fact, did he. The story of his descent into the Underworld and his return to the brightness of the sun is a myth, and myths are stories that are so true they can never happen. Something like his journey may happen to anyone. The human name for it may be despair. Le vent se lève; il faut tenter de vivre! The wind's rising; we have to try to live! You can read a transcript of Van Doren's remarks to the class of 1959 via the link. Mother: "What is a chair used for?" "It's not fun to watch other people in Hawaii." John Hicks was a brilliant pianist, one who (like Jaki Byard) ranged freely across styles. I've heard him on many records and was lucky to hear him in person, about 20 years ago, at a club in Central Square, Cambridge, Massachusetts. He was playing in a quartet with David Murray (tenor sax, bass clarinet), Fred Hopkins (bass), and Ed Blackwell (drums). For a reader who knows jazz, that should be all I need to say. Their work, compiled in the Cambridge Handbook of Expertise and Expert Performance, a 900-page academic book that will be published next month, makes a rather startling assertion: the trait we commonly call talent is highly overrated. Or, put another way, expert performers -- whether in memory or surgery, ballet or computer programming -- are nearly always made, not born. And yes, practice does make perfect. These may be the sort of clichés that parents are fond of whispering to their children. But these particular clichés just happen to be true. "I think the most general claim here," Ericsson says of his work, "is that a lot of people believe there are some inherent limits they were born with. But there is surprisingly little hard evidence that anyone could attain any kind of exceptional performance without spending a lot of time perfecting it." So often I've heard students say that they're "not good" at writing essays or at reading poetry, as if their present skills were beyond improving. The way to get better at these things, as I always say, is to work on them. My wife Elaine, our daughter Rachel, and I were recently talking about Yeats and Millay. (Rachel worked on a group project about Millay and has now read enough of her work to last a lifetime, thank you.) Elaine suggested that we ponder the idea of Yeats and Millay talking over breakfast. My imagination went to work (or play, really) developing a scenario. So make the most of this, your little trip. [H]e never speaks directly as to someone at the breakfast table, there is always a phantasmagoria. Yes, and there is even a phantasmagoria of the breakfast table. I'm no fan of Millay's delivery, I'll admit, and my passion for Yeatsian loftiness waned some time ago. My favorite readers of poetry are William Carlos Williams, Robert Creeley, and Ted Berrigan, vernacular Americans all. And here's another odd connection: Ted Berrigan appropriated "[T]here is always a phantasmagoria" as a tongue-in-cheek shorthand statement of his poetics. If you'd like to hear Yeats, here's a link. I'm unable to find a recording of Millay online. » William Butler Yeats reads "The Lake Isle of Innisfree"
Update: I found two Millay recordings. Do you have to be on a certain floor? Do you have to have money to eat lunch? If you are on a break, do you get to play on the Internet? From a wonderful bunch of questions. » What do fourth-graders want to know about college?